This year we are counting down to Christmas with Christmas children’s books! The idea is that every day leading up to Christmas we unwrap one book and read it together. When my youngest child, Molly, was 5 years old, an elderly friend took our family to the Dollar Store. For Christmas, she wanted to treat each of our children to five things from the store; five things of their choice. The second aisle was filled with toys! By the time we were two steps into the aisle, Molly had picked three more things. She was excited about the five things she had picked out. A minute later one of her sisters found something fun on the shelf and said, “Look Molly! Look at this! You should pick this instead!” She reluctantly chose that toy instead of one of the items already in her arms. This pattern continued up and down every aisle. Either I asked Molly if she was sure, or one of her sisters persuaded her to pick something else. Once we had finished browsing up and down every aisle, we checked out, and went home happy with our purchases –or so I thought. Read the rest of the story at Pandora’s Box Gazette. Rachel Schmoyer writes a regular Family Life Column for Pandora’s Box Gazette the fourth Monday of the month. Thanks for reading! Packed away in my tote of fall decorations is a little brown blank book that came from the dollar store. Warmth spreads through my heart when I flip open the cover and see handprints, doodles, and scrawled words inside. Each year for the past 11 years our family has taken some time on Thanksgiving Day to write or draw what we are thankful for. Each family member gets one page. Even the babies and toddlers participate by having their hand traced. Then either my husband or I jot down a few things the little one is really into at the moment. In an effort to get my heart ready for Thanksgiving I wanted to read about the times that Jesus had given thanks to God. I found that most of the time when the Bible says that Jesus was giving thanks it was in the context of mealtime. I can resonate with that! Our family already says a prayer out loud before our dinner time together. I chose five of those Scripture passages to study and from that study, I put together a five-day devotional. My prayer is that the devotional helps you fine-tune your heart of thankfulness since that is something we think about in the fall as Thanksgiving Day draws near. Click here to get your copy of Let’s Eat! P.S. Receiving the devotional will also subscribe you to readthehardparts.com, a new online community of Christians who encourage each other to read the hard parts of Scripture. If you already are interested in personality tests and analyzing personality then you will love Reading People by Anne Bogel of Modern Mrs. Darcy fame. Halloween is coming soon! In our family, my husband, Tim, takes the kids around to Trick or Treat in the neighborhood. I gladly stay home and hand out candy. A lot of the kids know me since I stand at the school bus stop with my kids and try to be a friendly face for all the kids’ morning. 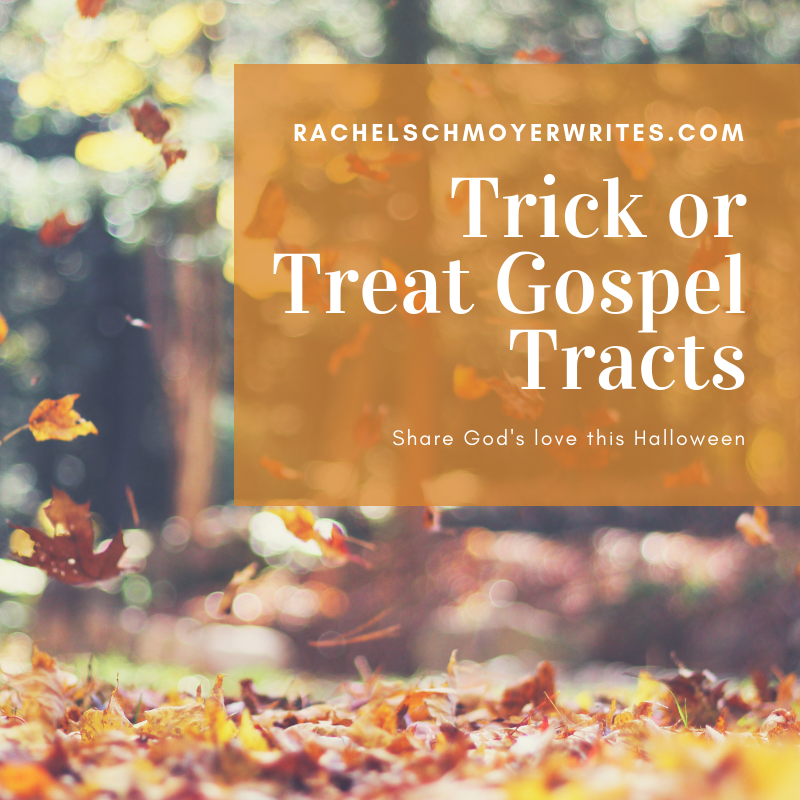 Every year, I hand out a gospel message of some kind along with a big handful of candy. I had success finding good Trick or Treat tracts the first couple years.